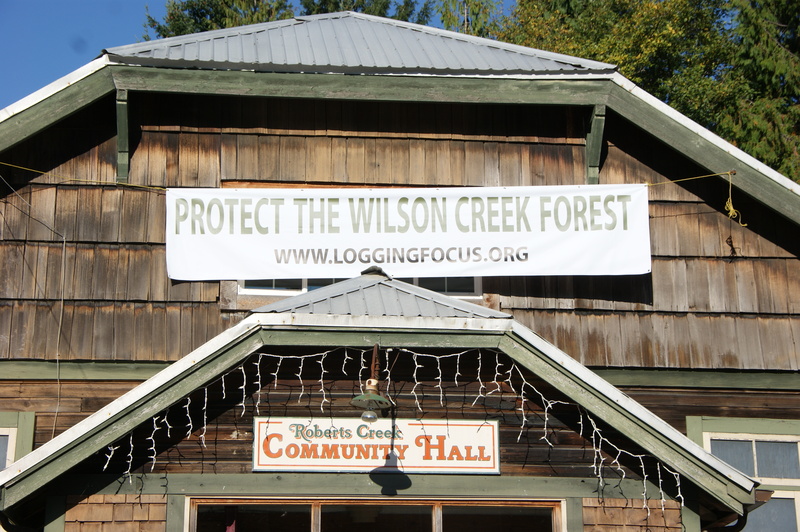 Elphinstone Logging Focus (ELF) and the Roberts Creek Community Association has cooperated on the display of a banner now in place in front of the local Community Hall. The banner reads: ‘Protect The Wilson Creek Forest’. 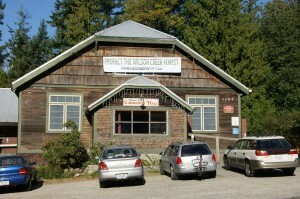 The RC Community Association had previously sent a letter to the District of Sechelt Council requesting that this unique, low elevation forest be set aside for several reasons, including forestry, recreational, wildlife, and bio-diversity values. In addition, the Roberts Creek OCP, states that the community should be concerned about having a back-up water system to the Chapman. Wilson Creek is a water source that could service residents on the western boundary of the community – this demands that all of the existing tree and vegetation cover be kept intact and functioning. ELF has recommended to Sunshine Coast Community Forest (the licensee of these Crown lands) the need for a wider public dialogue on the future of the highly-prized Wilson Creek Forest. With the high public exposure that this banner will generate on the Sunshine Coast, a greater number of residents will become aware of this local environmental issue.